Prayers help adjust the ‘rhythm’ of the body. Modern scientific research proved that Moslems’ prayer timings correspond with that of the physiological activities of the body. Thus, prayers are considered as the orchestrator that adjusts the ‘rhythm’ of the whole body. In his book ‘Seeking cure from prayers’, Dr. Zaheer Rabeh indicates that cortisone is the hormone of activity that starts to increase acutely in the human body with the approach of dawn time, and is associated with the rise in blood pressure. Man feels greatly active after dawn prayer between 6-9 a.m. Thus the time after prayer is considered the best time for hard work and seeking livelihood. The Prophet Mohammad (PBUH) was quoted saying; “O Lord, give benediction to my umma (nation) at the early morning time.” Ozone, which has an invigorating effect on the nervous system, and muscular and mental activity, reaches the highest levels in air at such a time. Contrary to this is the forenoon time in which secretion of cortisone reach the minimum limits; leading man to feel exhausted with the stress of work, and the need to have rest. This is almost after 7 hours of early get-up. Here comes the time of noon (Zuhr) prayer, which gives complacency and quietness to the exhausted heart and body, and following which man seeks to get an hour of sleep that gives him rest and reinvigorates his activity, in what is termed as Qailulah (nap) before (Asr) (afternoon) prayer. Such a short sleep was mentioned in the Prophet’s saying; “Get help with Suhoor (meal before dawn time) for fasting, and with Qailulah for Qiyam (night) prayer.” He also said; “Have Qailulah, as satans do not have it.” It has been proved that the human body at this period generally encounters a hard time, where an increase occurs in an anesthetic chemical substance secreted by the body that has the effect of tranquilizing, and incites man to sleep. The body, after 7 hours of early wake-up, is at the lowest levels of concentration and activity. So if man ignores sleeping at that time, much of his neuromuscular compatibility decreases all day long. Most of the Quran Commentators agreed that the middle prayer is Asr prayer. With the discovery of the increase of Adrenalin hormone at this time, the reason behind this Quranic remarkable command of the keep-up of Asr prayer becomes crystal clear. 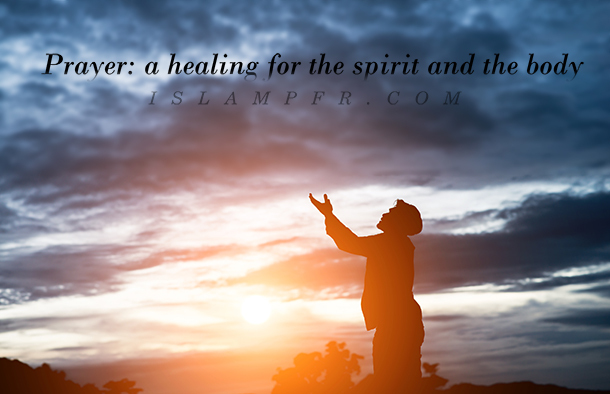 Performing Asr prayer at designated time, alongside with other extra prayers, reinvigorates the heart gradually to function more effectively after an inert state. So the rest of bodily organs and senses are in deep concentration in prayer, making it easy for the heart and the hormone to adjust the normal rhythm of the body which reaches the climax at that time. Then comes the Maghreb (sunset) prayer. In contrary to what happens early in the morning, Cortisone decreases and the activity of the body starts to diminish. With the transfer from daylight into night darkness, melatonin increases encouraging relaxation and sleep, and causing laziness to the body. Here prayer comes as a transitional station. Prayer of Isha (early night prayer) is the last station in the course of the day, wherein the body is transferred from the state of activity and mobility to a state of seeking sleep with the spread of darkness and the increase of melatonin secretion. Therefore, it is commendable to delay Isha prayer to the time before sleep so that all man’s preoccupations are finalized, and sleep comes next. The regular secretion of melatonin is closely related to the sexual and mental maturity, which is the consequence of following a fixed programme and a way of life. Therefore, we find that adherence to perform prayers on time is the best way that guarantees an integral compatibility with daily activities, thus leading to highly efficient functions of human body systems. Prayer is a prevention from varicose. Legs varicose is a common dysfunction in the legs veins, which takes the shape of big and zigzag veins filled with blood of a changed colour all along the lower limbs. Dr. “Tawfiq Elwan”, a Professor in Alexandria Faculty of Medicine (Egypt), indicated that with the meticulous observation of prayer movements, it was found out that prayer is distinguished with a wonderful measure of smoothness, harmony and coordination, represented in standing, kneeling (Ruku’), prostration (Sujood) and sitting between every two prostrations. With a scientific study of the measure of pressure exerted on the walls of the saphenous vein at the ankle joint, it was found out that the great decrease in that pressure during kneeling reaches almost the half. As for the state of Sujood, the average pressure becomes very slight. Naturally, this decrease is a full rest to that vein, which is greatly exhausted due to the severity of pressure all along the periods of standing. The position of Sujood helps the blood circulation work in the same direction of earth gravity, as blood which always suffers the bitter creep from the feet soles to the cardiac muscle, now pours smoothly and easily from top to bottom. This process reduces much of the vein pressure over the feet dorsum around 80 times (from the state of standing to the state of Sujood). Consequently, the risks of having varicose, which rarely affects those performing prayers regularly and properly, are diminished. Powers of pressure and pulling exercised by the muscles and tendons, which sticks to bones, during flexion and extension. ii. It has been recently proved that an electric current with two different poles runs inside the bones; affecting the distribution of cells functions such as anabolism and catabolism cells. The current also determines at large the aspects of these cells activities. The experiments proved that in case of laziness and rest, the electric current is diminished, leading the bones to lose the componential materials, thus they become thin and weak. Experiment also revealed that during travel to space where gravity is totally absent, muscles become weak and bones become thin due to the inability to resist the burden of the earth gravity. It is therefore deduced that complete rest causes the bones to shrink, as the absence of movements activates catabolism cells, and weakens anabolism cells, hence a reduction of the bony material occurs. – The performance of 17 units (Rak’ah) of obligatory prayers, and some more of extra prayers, strengthens man’s bones, and forces him to do a bodily movement not less than one hour daily. This happens all along the life of the Moslem, who never abandons prayers. – Prayer is a regular simple exercise at different times, and helps keep the viability of the body specially the cardiac system and blood circulation. – Prayer is a psychological therapy that helps calm the soul and relieve all tension for many reasons, of which the most significant is: man feels that all his problems are very small in the face of the Greatness and Capability of the Creator Who handles this large universe. The Moslem, after finishing his prayer, has thrown all he has of problems and worries, as he has deputized the Merciful Lord to manage and relieve him of such troubles. Prayers help remove all sources of tension due to the constant change of movements. It is known that such a change leads to an important physiological relaxation, therefore, the Prophet commanded that the Moslem when afflicted with a state pf anger, should resort to prayers. It has been proved that prayer have an immediate effect on the nervous system, as they calm agitation and maintain balance. They are as well a successful treatment for insomnia resulting from the nervous dysfunction.